We shuttle from Cusco or The Sacred Valley towards the town of Chincero, from where we start one of our favorite rides at 3,800 m (12,467 ft.) of elevation. After one and a half hours of singletrack climbing, we max out at 4,320 m (14,173 ft.). Arriving at our summit, we’ll be able to take in all 360° of breathtaking Andean landscape. Then, after calming our lungs, we start the singletrack descent along an Inca Trail that carries us to the Inca Ruin Huchuy Qosqo. This mountain bike trail boasts major flow, coupled with awesome sections of rock steps and technical verticals. Before arriving at Huchuy Qosqo, we’ll pause a bit to gaze down into the Sacred Valley from an absolutely ridiculous vantage point. Later, we’ll carry on our descent down a technical singletrack towards the town of Calca. This trail is an epic adventure! In the evening our transport returns to Cusco; however, if you have plans to visit The Sacred Valley or Machu Picchu, you might choose to remain in one of the small towns of The Sacred Valley. Hey, we’re flexible. We’re happy to help arrange lodging in either Cusco or The Sacred Valley or to assist in planning your visit to Machu Picchu. Just ask! 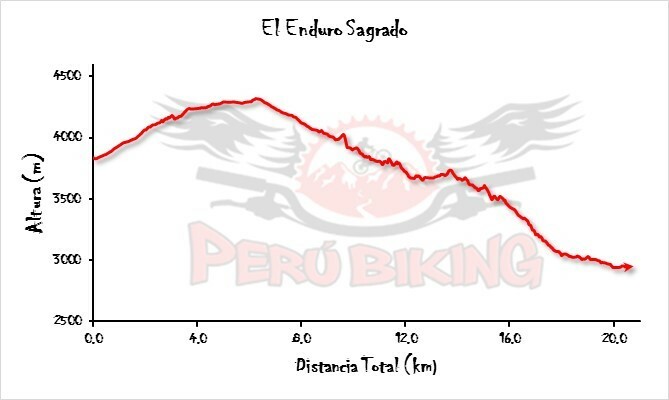 Note: Peru Biking requires that riders first complete an Intermediate level Full-Day Tour before attempting trails of greater difficulty. Sorry, shredders. Rules are rules. All of our Full-Day Rides are operated in privately arranged tours to guarantee the best experience for riders.